Home >> Analysis and Features >> Only one runway in 50 years. India’s lagging airport expansion. In 2006-07, Mumbai and New Delhi airports were awarded to M/s GMR and GVK and entered an era of private airport management. In the mean time, private public partnership greenfield airports were in progress at Kochi, Hyderabad, and Bangalore. Passengers across the nation waited with anticipation to finally be free of the poor service standards of the Airports Authority of India. Over the last ten years, much has changed. India is soon expected to become the third largest aviation market behind China and the United States. The country’s airlines have placed massive orders for new aircraft. India’s largest domestic carrier, IndiGo, is the world’s largest customer of the new Airbus A320neo (new engine option). It will also, by December cross the 1,000 flights a day mark. 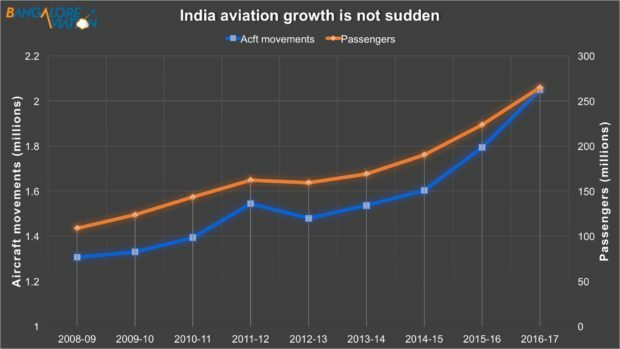 Airports across the country, are struggling to keep up with this growth. Major airports are unable to accommodate peak time traffic growth. In a country where air travel growth is approaching double digits, Mumbai is growing at a meagre one to two per cent. New Delhi, despite three runways, has to disrupt flights to accommodate much-needed runway maintenance, as did Bangalore. Airside infrastructure includes the size of the aprons, number of parking bays, contact (aero-bridge) stands, non-contact (ladder) stands, air traffic control, etc. Terminal capacity determines the number of passengers that can pass through the terminal(s). Like the strength of a chain depending on its weakest link, the smallest of the above three elements determines the final capacity of an airport. Airport companies have lavishly spent on creating glitzy terminals, but have failed to provide a proportionate share of their capital expenditure to runway and airside capacity. While air traffic and aircraft movements have grown, the entire country of India has seen the addition of just ONE new runway in the last 50 years. Note: At Bangalore and Hyderabad, newer one runway airports replaced older one runway airports, and this is zero net addition. Airports are already challenged to accommodate additional flights. Peak hours at almost totally saturated. Mumbai is completely saturated, Bengaluru will saturate before its second runway is commissioned. New Delhi is near saturation. The situation at the other major metros and the holiday destination of Goa is not any better. 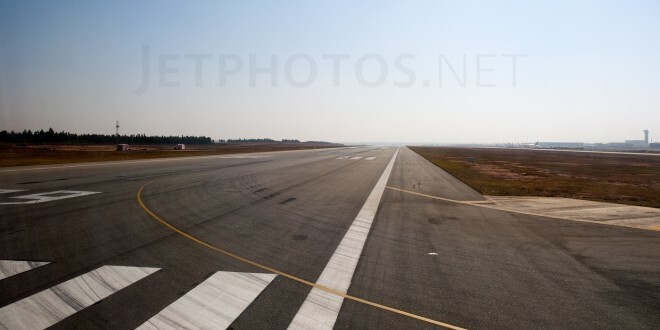 An air traffic movement or ATM is defined as one takeoff or one landing. ATMs per hour is a key measure of airport capacity and all major airports have been growing in terms of their ATMs. The slow growth at Mumbai and other airports are a reflection of the airside infrastructure constraints. 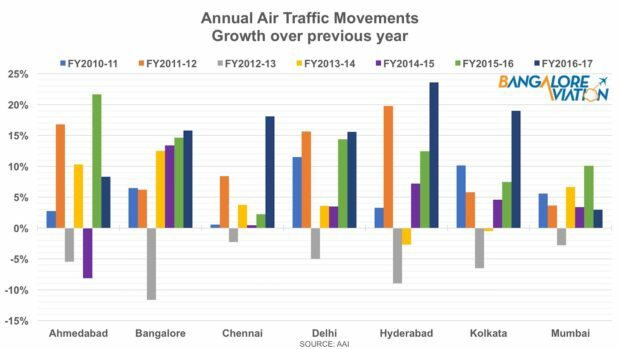 Annual aircraft movements growth over previous fiscal at major Indian airports. Chart by Devesh Agarwal/Bangalore Aviation. 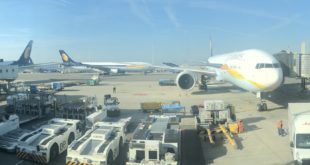 Jet Airways and Air India have inducted wide-body aircraft for some domestic flights between the large metros, and this has increased the average number of passengers per flight. However, India’s domestic flying is still dominated by short narrow-body aircraft flying short sector flights. The average flight duration is 1h10m. Like much of the world, the mainstay aircraft are the Boeing 737-800 and Airbus A320. 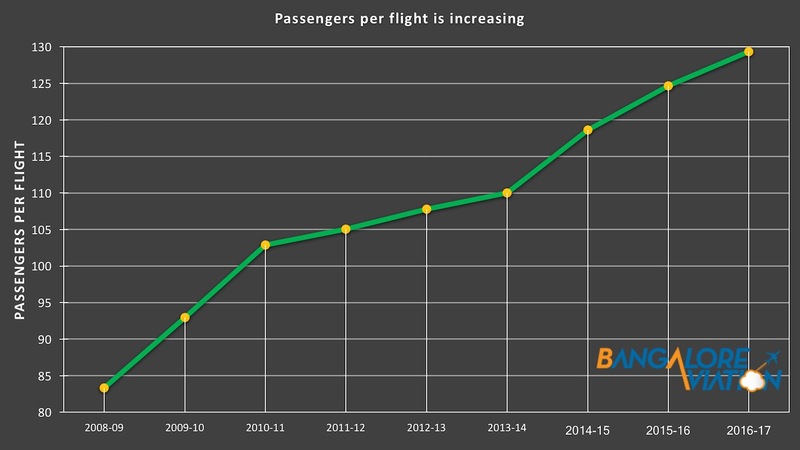 Average number of passengers per domestic flight in India since fiscal year 2008-2009. We do predict that Indian carrier will convert a part of their orders into stretched single aisle variants (the Boeing 737 MAX 8 to 737 MAX 9 or MAX 10; the Airbus A320 to A321). However, the different economics of these larger aircraft may have a detrimental effect on the already stressed bottom-lines of airlines. This will be an unfair situation where airlines will take a hit for the lack of investment by airports. Runway capacity is already a challenge at key metro airports and this has affected the ability of airports to allocate slots to airlines, especially during the peak hours of 6am to 10am and 5pm to 9pm. The situation is showing no signs of improvement in the short term, in fact it will likely get worse before it gets better. Add to this mix the small regional flights under the Government’s pet UDAN scheme, and an already stretched runway capacity will be worsened. With land acquisition and related challenges common in India, the Navi Mumbai is highly delayed, and the second airport at Chennai remains still on paper. New Delhi airport’s 4th runway is in the works but the target date of 2021 is still soft. Passenger demand continues to grow. Yet airports are focused on building larger and fancier terminals. In fact, the newer terminals look like shopping malls with boarding gates attached, rather than the other way around. Unfortunately, this situation is driven by non-aeronautical revenues being critical to airport profitability. Cost over-runs are common, and passengers are often inconvenienced by having to pay more, walk more, and wait more. We have to credit the Bengaluru International Airport Limited, the operators of the Kempegowda International Airport at Bangalore. Their expansion plans call for a second runway to be commissioned by 2019, well before the second terminal. The second terminal calls for lesser contact stands (aero-bridge boarding) and more non-contact stands i.e. bus gates. While more than half of all domestic flights will board using busses, the walk will be greatly reduced. An informal survey conducted amongst frequent fliers evoked an even division on the convenience of aero-bridge boarding vs. the inconvenience of longer walking. Annual aircraft movements at major Indian airports. Steady growth, yet airside infrastructure lags. 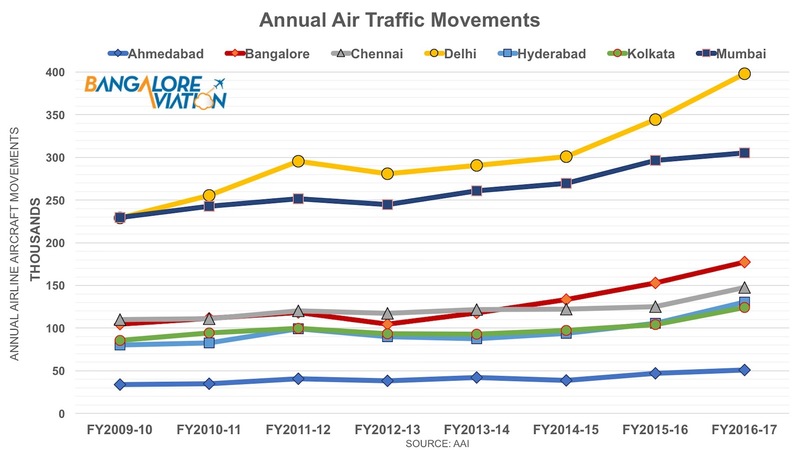 Chart by Devesh Agarwal/Bangalore Aviation. Aviation has been growing steadily. Airport operators could see the growth and should have planned for it. Passenger demand growth for the next five years is only going to aggravate the situation further. 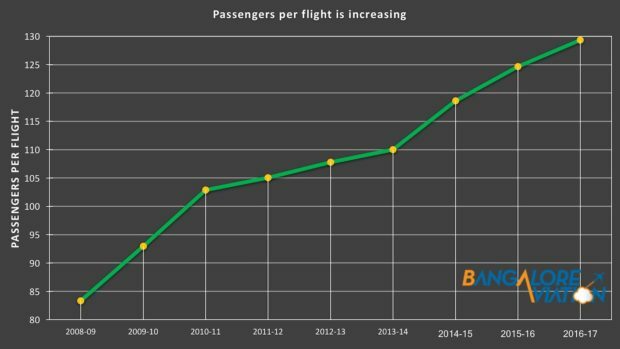 Simply put – India’s current airport capacity is grossly inadequate to cater to the growing passenger demand. A supply demand imbalance is certain in the medium term. Flight slots are the new asset, and the airlines that have it will benefit, while new entrants, notably Vistara, will continue to be handicapped. The Government’s pet UDAN regional connectivity scheme is already faltering at metro airports which are not allocating slots. Capacity enhancement is the need of the hour. However, current policy is blasé; it neither encourages airside development, nor penalises the lack of it. Tell this to the government and they will undertake yet another study, a series of meetings, and no results. Tell this to airport operators and they will use it as an excuse to further construct more terminals with cost over-runs which do nothing for airside infrastructure. The “comfortably numb” and lackadaisical attitudes have to be upended. India desperately needs the aviation equivalent of the “Metro Man” E. Sreedharan. While airport, magazines, publications and social media may gloat over how India has upgraded its airport infrastructure, the stark fact remains, Indian airports have a net addition of just ONE runway in the last 50 years. What are your thoughts on this topic. Share your views via a comment.